We spotted this post on Bookish.com’s Romance page, and they’ve graciously allowed us to share some of it here on XOXO After Dark! The complete article can be found at Bookish (link at the bottom of this post). Enjoy! “Losing It” by Cora Carmack. 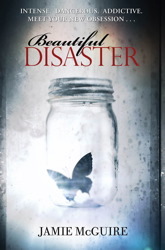 “Beautiful Disaster” by Jamie McGuire. “Reflected in You” by Sylvia Day. In the past year, New Adult novels have moved from the self-publishing realm to the forefront of major romance publishers, with their varied readership eagerly following. Thanks to word of mouth, these intense stories of first love between emotionally damaged characters in their mid-20s are filling a vacancy in the romance genre. “I view New Adult as really bridging that gap between traditional young adult and contemporary romance,” says Margo Lipschultz, senior editor at Harlequin. “Until a year ago, you didn’t find easily available stories about kids in college who are experimenting with that newfound sense of liberation but also the heightened responsibilities that accompany it.” Generally, the heroine is 18-24 years old, while the hero is 18-26. “A college setting is common but not mandatory,” says Pocket Star editorial director Lauren McKenna. Now that major publishers are releasing New Adult novels, many more contemporary romance authors are trying their hand at this liminal genre. What’ll you get when reading New Adult? Bookish spoke with top editors and authors to pinpoint New Adult’s key characteristics. While situations in New Adult lit seem more dramatic than in real life, they stop just short of being over-the-top. Avon editor Amanda Bergeron cites Lisa Desrochers’ “A Little Too Far,” which kicks off with the heroine sleeping with her stepbrother before leaving for study abroad–then, in her guilt, falling for an almost-priest who’s only months away from taking his vows. Learn more about what to expect from the New Adult category when you read the full article “What Is ‘New Adult? '”on Bookish HERE. Interested in other Bookish romance features? You might like these…all available on Bookish.com! College senior Bliss is tired of being the only virgin she knows...it's time to do the deed and get it over with. Garrick seems like the perfect deflower-er...but things don't go as smoothly as she's planned. The original good girl-meets-bad boy tale that started it all. An ex-Army Ranger falls for a small-town girl with demons of her own. Sequel to the edgy, passionate IF YOU STAY. One engagement. Two brothers. Four days. How hard could it be? Thanks for the info. It has been a topic of confusion for many readers but I have enjoyed the titles I have read in this category which seems to be rapidly expanding.